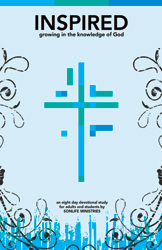 Sonlife is giving away an eight-day devotional ebook for students titled Inspired, by Jeff Frazier. Description: To love God with our minds involves an ever-growing and expanding knowledge of who God is and how he relates to the world. Just as you would want to get to know more about a person you love, Inspired takes us on a journey of loving God through learning different attributes about him. I really appreciate the balance between scripture, teaching and questions for personal reflection in this quiet time material. It’s definitely not one of those “one verse and a heart-warming story” devotionals — this one will actually require some time to work through each day. Although I’m no longer an academic student, I’ll always be a student of scripture, making this student devotional a resource that’s not only for teenagers, but for myself, as well. ht to Chris for the resource.